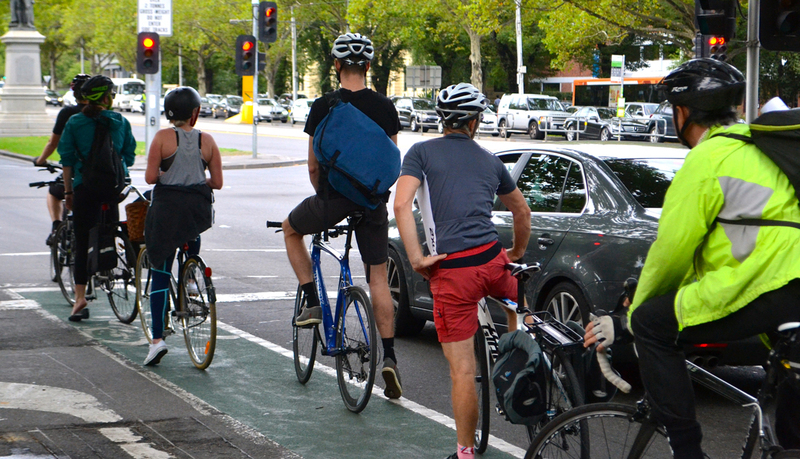 Many thousands of Australians ride to work every day, shrinking the crawling queues of peak hour traffic, saving money on petrol and parking and taking two wheels instead. If you live within 15km of your workplace, getting there by bike is the smart choice. If you live too far to ride the whole way, jumping on your bike instead of driving to the train station is a great way to get your daily dose of fresh air and exercise. For those who haven’t commuted by bike before, our Ride2Work program is the perfect place to start with tips and resources to help you get pedalling. If you live within 15km of your workplace, riding is likely faster than other modes of transport during peak periods. For longer journeys, consider saving time by riding partway then catching the train. By making your commute a workout, you’ll also save time you might otherwise have spent at the gym. You’ll be surprised how far you can ride. If you initially can’t manage the full trip, catch the train part way and gradually increase the distance as your strength builds. Once you start riding regularly, your fitness and overall health will quickly improve. Use online mapping tools or talk to other riders in your area to find the most bike friendly routes. Opt for off-road paths and quiet back streets, or roads with good bike infrastructure and a high volume of riders. Do a trial ride on the weekend, and consider recruiting a friend or colleague to ride with you. Quick-drying, lightweight clothing that allows for freedom of movement is ideal. Check to see what end of trip facilities, such as lockers and showers, your workplace provides. If yours is a short, relaxed commute you may be able to ride in your work clothes.